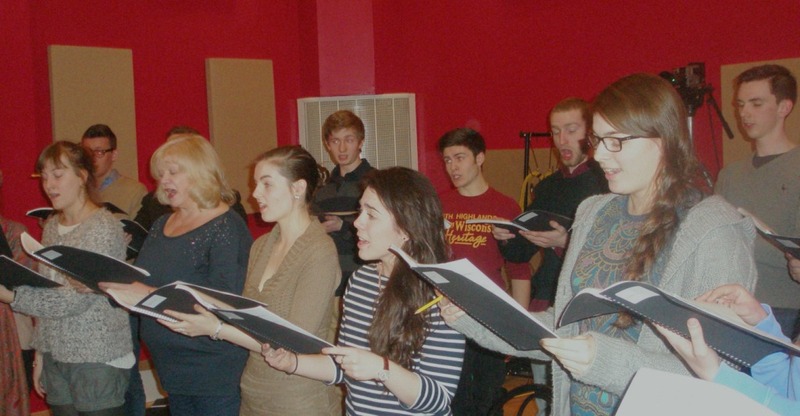 Concert: the University Chapel Choir sings Burns! As this is my first blog-post of the year…happy 2014 to everyone! Things have been very busy here at the Centre for Robert Burns Studies, with the long build-up to the annual Burns Conference at the Mitchell library on Saturday 25th, which was packed with plenty of thought-provoking papers, beautiful singing, celebratory whisky, and crowned with the unveiling of a new Burns Manuscript! As if that was not enough, the conference was followed in the evening by an International Burns Concert at the SSE Hydro – all in collaboration with Celtic Connections. Exciting times indeed! Instead of illustrating an item from the Hunterian Museum Collection, which remains my intention for future posts in this blog, this time I would like to tell you about an event which will be taking place here at the University this Thursday, on the 30th January at the University of Glasgow Concert Hall. To take the celebrations for the Bard’s birthday further, this week the ‘Music in the University Lunchtime Concerts’ series will be entirely dedicated to choral settings of Robert Burns’ songs, performed by the University’s Chapel Choir. The event is in collaboration with the Centre for Robert Burns Studies, and supported by the Chancellor’s Fund. The concert is free and unticketed, so do come along! the repertoire will comprise of a cappella and accompanied settings and arrangements of Burns’ songs, by composers ranging from Robert Schumann to James Macmillan, from Ralph Vaughan Williams to Ian Whyte. To quote Dr Kirsteen McCue and Prof. Marjorie Rycroft, “Each musical creation has taken Burns’s work to different places entirely, not just linguistically and musically, but, indeed, culturally” (‘The Reception of Robert Burns in Music’, in The Reception of Robert Burns in Europe, ed. by Murray Pittock, forthcoming). It truly is remarkable how much Burns has inspired musicians and composers Europe-wide – or maybe I should say world-wide, since “‘Auld lang syne’ is, next to ‘Happy Birthday’, the best known and most often-sung song across the Globe” (ibid.)! The event is but one of the outcomes of the project ‘Robert Burns choral settings: from Schumann to MacMillan’, started by Dr Kirsteen McCue (co-director of CRBS) and James Grossmith (Director of Chapel Music) with whom I have had the pleasure to collaborate. The project is a work-in-progress, and soon it will be online with its own interactive website! I will update this blog with the details as soon as the website is up and running. The website will give you more information about the settings and their composers. Also, the Chapel Choir has recorded performances of these songs, and they will be made available for downloading. During the project it has been my task to go through database over database of settings of Robert Burns songs. I couldn’t count just how many I have found! out there is a prodigious number of settings, between arrangements and original compositions. Out of these I have had to ‘extract’ the choral settings – which narrowed things down a little, at least. My selection was then further narrowed to a range of less than twenty songs…and the choice has not been easy! For the concert we have selected some of the songs we think our audience of Burns-lovers will enjoy. We hope to see you all there for what promises to be a lovely concert – and, of course, another occasion to celebrate Burns’ birthday! Previous story A Toast for George Washington, as well as an ‘Ode’?